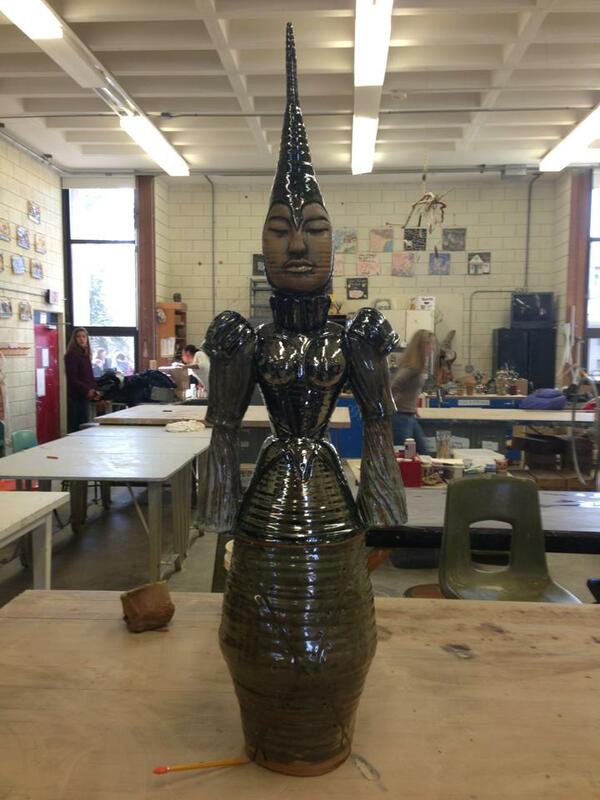 Amy Kandall’s most recent ceramic sculptures are roughly life-sized. 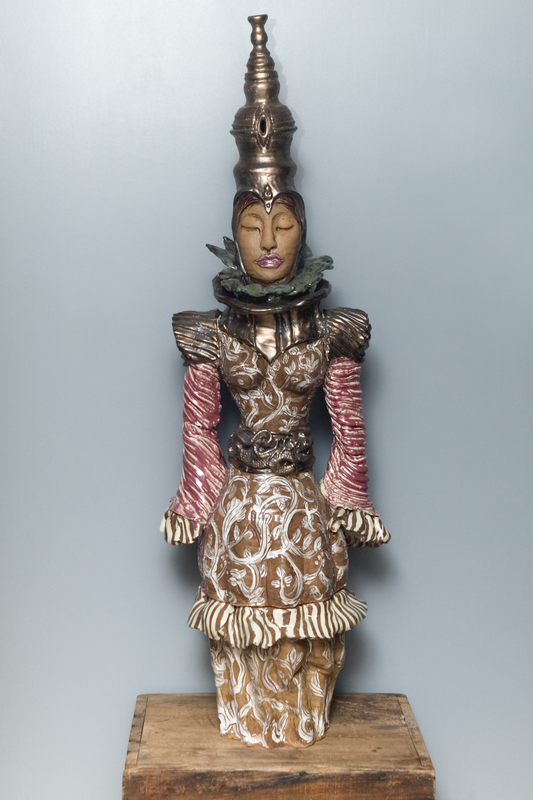 Standing in their presence, we understand their scale through that of our own bodies; this uncanny relationship was explored by the Surrealists’ fascination with mannequins, and doubles. Each figure is made of three parts both hand-built and wheel-thrown. As bodies made of modular forms, more recent associations also abound: from the domestic robots of the Jetson’s and the Stepford Wives to ever-transforming cybernetic superheroes. 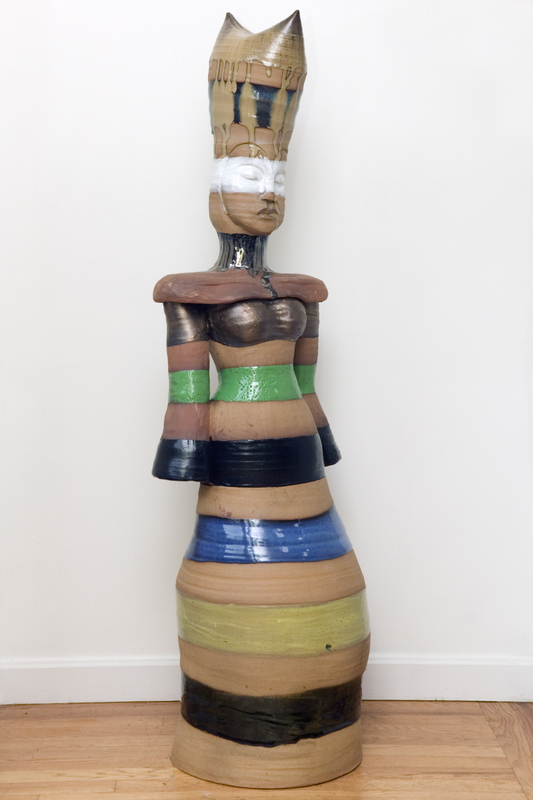 Although they are a dramatic departure in scale from her earlier ceramic sculptures, in these large female forms, she continues to explore tensions of figural form and surface. Flesh and cloth are conflated and confused. The surface is cut through, peeled back and exposed. These openings and cuts in the surface are spaces of absence and access, providing for flow through and from the sculpture. Surfaces are worked, abraded or obsessively layered with texture, glaze, or paint. A blue diva’s carapace is suggestive, all at once, of a water tower, a robin’s egg or a coveted Tiffany jewel box. The result of research into totemic world cultures, and the generative, creative forces attributed to female deities, these columnar caryatids are formed of mute matter that is activated by our associative mediation upon them. Many have closed eyes, turning inward on their potential, not yet revealing themselves to our gaze. 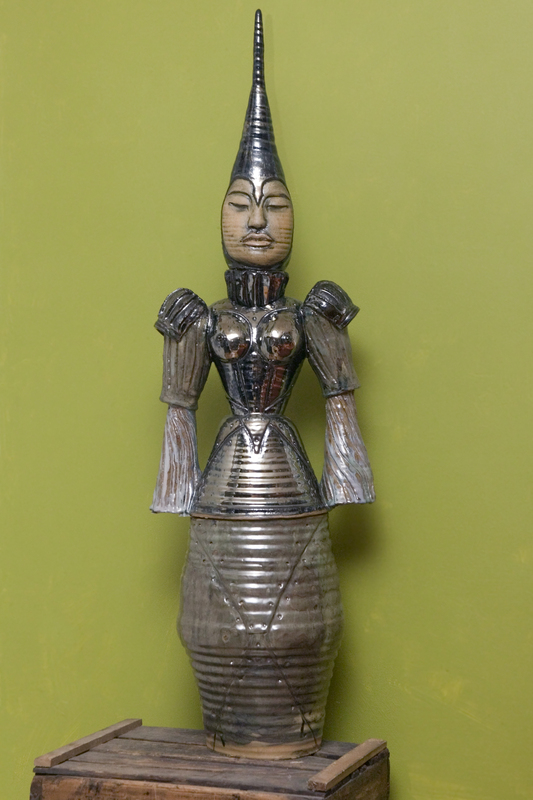 Like African Power figures (Nkisi) that draw their force from materials contained in their abdomens, and that are empowered by nails driven into their wooden bodies, these female warrior figures seem almost brought to life, suspended at a moment just before awakening to sentient presence. An exhibition of this new work opens July 12, 2013 at the Esmond-Wright Gallery in Provincetown.